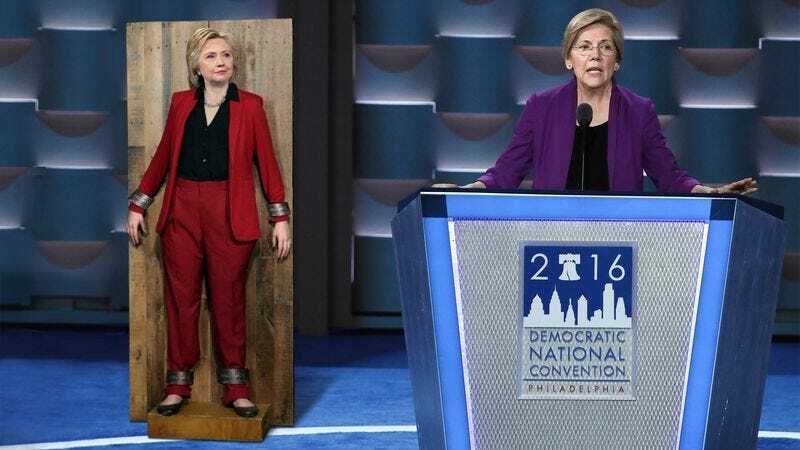 PHILADELPHIA—Sending terrified gasps through the audience as she pulled back a thick velvet curtain onstage to reveal the formidable politician, Massachusetts senator Elizabeth Warren assured the thousands of progressive onlookers at the Democratic National Convention Monday night that the docile Hillary Clinton standing before them meant them no harm. “Ladies and gentlemen, there is no need to fear this candidate, for despite her menacing reputation, she will not attack you or your progressive movement,” said Warren, who then wowed those in attendance by signaling for the compliant Clinton to repeat a series of talking points about regulating financial institutions in an effort to prove that the presumptive Democratic nominee could easily be trained and was not roused into a horrible frenzy by the presence of radical reforms. “Despite the tales you may have heard, she is nothing but a tame, pragmatic Democrat. The terror she stirs inside you belies her true gentle nature. I assure you she is no threat to the policies you hold most dear.” At press time, Clinton had broken free from her iron restraints, ripped off both of Warren’s arms, and tossed the senator’s body into the crowd.